AHIN-SIF-00910 • Sourdeval • One bedroomed detached house is in a quiet rural hamlet • superb views over surrounding countryside. There is a separate one bed guest annexe which is attached to the house. This delightful stone house has been considerably improved by the present owners and benefits from tilt and turn PVC windows with roller shutters which were fitted in 2012, some re-wiring, a new oil fired condensation boiler and a recently fitted kitchen. 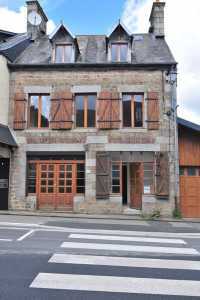 AHIN-SIF-00915 Mortain 50140 Lovely detached village house within walking distance of Town with possible building plot. The property has been renovated and benefits from partial double glazing and a superb position within a wooded hamlet with superb views out from the rear garden. This village house benefits from double glazed windows, a self-contained annexe or gîte and a good sized garden. There is a large detached barn used as a Mechanic's Workshop. The property has been renovated by the present owners over the last 12 years..There is the additional benefit of a separate granny/teenage annexe. The huge barns would be ideal for a car collection, workshop, storage, etc. 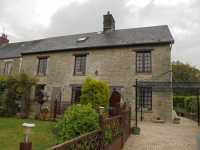 AHIN-SIF-00791 Nr Mortain 50140 Superb contemporary 3 bedroomed Farmhouse in Normandy with just under an acre of garden and a double garage. This delightful property benefits from under floor heating on the ground floor and the addition of a conservatory. The property was rewired about 10 years ago and is fitted with double glazed wood framed windows.